Owning a Hallberg-Rassy is a great privilege and the dream of man sailors. Personally, I find these boats to be some of the finest available, and I am thus a very proud owner. Yet, it is a heavy investment financially, even if many owners count on getting back the money the day they sell. I have owned four HR boats during the years and talked to countless HR-owners as an active consultant, helping many owners to choose and specify their Hallberg-Rassy of their dreams, both new and pre-owned. This has provided me with a profound knowledge of what people really want and need, as well as what works and what possible better should be avoided. 1. You do not plan to buy a Hallberg-Rassy, but enjoy sailing a HR. Many of my customers look beyond normal chartering of mass-produced boats in crowded areas, where everyone else tends to charter boats. 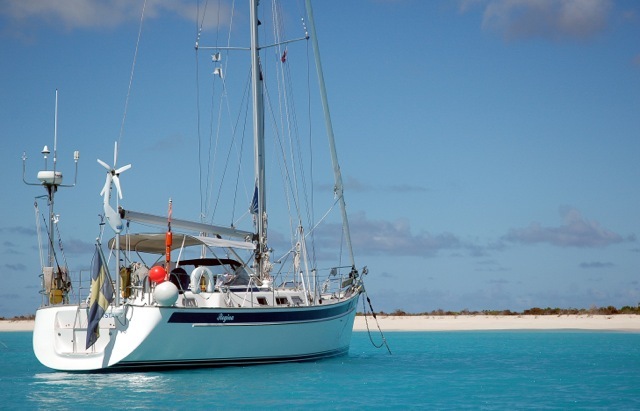 They seek a slightly more exclusive and luxurious sailing holiday, wanting to sail a Hallberg-Rassy. Sailing a Hallberg-Rassy gives the experience to sail in safety, comfort and style, taking you to places, you would otherwise not see. Joining on Regina Laska is so much more than a normal bare-boat charter. You will be guided to cruising grounds you would normally not consider, giving you the most extraordinary experiences. Regina Laska is typically taking us to exclusive cruising grounds which often are considered as too challenging for most sailors, such as Shetland, Orkney, Scotland or crossing the North Sea or the Bay of Biscay. Feeling the comfort and safety when sailing on a stylish Hallberg-Rassy boosts your enjoyment. Hallberg-Rassy’s are built to sail in the finest corners of this world! Come and join us! 2. You plan to buy a Hallberg-Rassy, but want to try sailing one first. Joining a Regina Laska cruise is reaching so much further than a standard trial sail for a couple of hours. It puts life to the boats shown at boat shows. Sailing and living for several days on a Hallberg-Rassy while discussing your needs and requirements onboard may give you a better picture of what you really need and want. Feel for yourself if a Hallberg-Rassy is the type of boat you would like to own. While Hallberg-Rassy’s differ in size (and price) they have many things in common. Come and discuss the boats and take advantage of my experience! This can save you a lot of money, so joining on a Regina-cruise can be a very good investment. 3. You have already bought a Hallberg-Rassy, but wish to get some support during your first days at the helm. Commissioning your new Hallberg-Rassy is a grand and happy day, but this is also the day when you are confronted with a lot of new technical equipment on a complex new boat. I have supported customers during this intense process, and also sailed with them on their new HR for a couple of days to provide them with valuable tips and tricks and also to show them the most beautiful spots in the areas around Ellös, giving them a wonderful beginning of many years of happy ownership. Pick a leg of your desire that suits you, or contact us to discuss your requirements.